The Hilo Volcano tour is a unique way to spend you day. After you fly into Hilo, you will visit the Hawaii Volcanoes National Park and learn about the seismic activity and culture built around it. 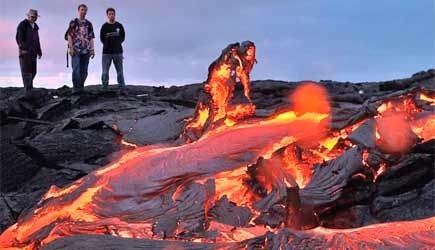 Explore Mauna Loa, the world’s largest volcano, and Kilauea,the world’s most active volcano. 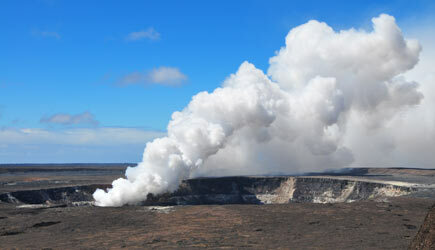 Big Island’s culture & legends are closely tied with the natural phenomena of the volcanoes, steam vents, and lava beds. You are not guaranteed to see red-hot lava flow, you may experience a smoldering crater or a steam vent. Along with the volcano, you take in some beautiful & unique scenery. Tour includes: Complimentary hotel pick up from/to Waikiki hotels, round-trip airfare, and guided tour of the Big Island. What to Bring & Wear: Please bring your photo IDs for flights. Wear comfortable, covered shoes and dress appropriately. You may wish to bring a light jacket and anticipate both sun and rain conditions. Surface lava flows may be present but may not be visible due to environmental conditions or time constraints. If conditions permit you may be walking/hiking on rough, uneven lava surfaces so wear sturdy and covered walking shoes. Note: Meals will be available for purchase. Highlights include: Hawaii Volcanoes National Park, Thurston Lava Tube, Richardson’s Black Sand Beach, Mauna Loa Macadamia Nut Factory, Kilauea Visitor’s Center, Jaggar Museum, Kilauea Iki Crater, Rainbow Falls State Park. The tour route may be modified due to National Park Advisories. Highlights of this tour are subject to change without notice and may vary at tour driver discretion in order to take into account National Park Service advisories, weather advisories, traffic advisories, road closures and detours and venue hours of operations. With the Big Island Day Trips from Oahu, travel 45 minutes and experience a very different landscape. The vast & expanse lava fields resemble the surface of the moon. On this daylong trip you fly into Kona, and from there you begin your adventure at Parker Ranch then you will travel to Rainbow Falls State Park where you witness the beauty of soaring waterfalls cascading from a natural volcanic backdrop. Next is Big Island Candies, and they are famous for their chocolate-dipped, macadamia nut shortbread cookie. Next, you’ll make your way to Hawaii Volcanoes National Park. Your journey begins at Jaggar Museum and Hawaii Volcano Observatory, and keep your eye out for the active, smoldering crater close by. The active volcano continue to add to the landscape of the lava fields. Mauna Loa, the world’s largest volcano, and Kilauea, the world’s most active volcano are found here. Other unique sites are the Thurston Lava Tube, and the Fern Tree Jungle. Depending on the conditions, you may be able to circle a crater when you ride along the Crater Rim Drive. Then you return to the lava fields where you will experience the various shades of solidified lava, which reveal the history of the island’s volcanic activity. There is a clear distinction between the lava fields & lush farmland. The changing landscape will carry you to the nearby Punaluu Beach. This amazing black sand beach is where sea turtles often nest. You will stop at the Royal Kona Coffee on the western coast of the island where the landscapes is lush and the beauty is remarkable. Also, along the coast is Kealakekua Bay and the overlook offers spectacular views of its pristine waters. 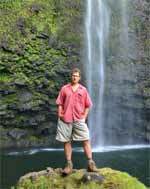 This adventure is an excellent way to explore the interesting and fascinating sights of the Big island. What to Bring & Wear: Please bring your photo IDs for flights. Wear comfortable walking shoes and dress comfortably, and bring a light jacket. Restrictions: Volcanic fumes can be hazardous. This tour is not recommended for visitors with heart or breathing problems and infants, young children, and pregnant women. Highlights include: Kailua-Kona Town, Parker Ranch, Rainbow Falls State Park, Big Island Candies, Hawaii Volcanoes National Park, Thurston Lava Tube, Punaluu Black Sand Beach, Hamakua Coast, Kealakekua Bay Overlook, Coffee Plantations. Please note that the route may be modified due to National Park Advisories. Highlights are subject to change without notice and may vary at tour driver discretion in order to take into account National Park Service advisories, weather advisories, traffic advisories, road closures and detours and venue hours of operations. For the ultimate in personal freedom and flexibility in your day, perhaps a fly-drive package is right for you. This includes round-trip airfare to the Hilo airport (ITO) on the Big Island (which is the closest airport to Kilauea Volcano) and a rental car for the day. Once you get there, you are free to drive around and explore the island on your own. This package does not include transportation between Waikiki and the airport. The driver of the rental car must be 25 years of age or older with a major credit card in his/her name. Time: Typical itinerary is 6am departure and 8:30pm return on the same day. If you have other flight requests, please contact us at 1.877.678.7333. 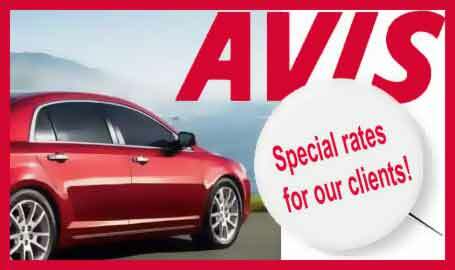 Reservations: Fly-drive reservations must be charged at the time of reservation and are non-refundable. They should also be considered non-changeable as any itinerary changes will result in significant change fees plus the difference in cost in the airfare, if any. Most guests who wish to fly to the Big Island for the day have Kilauea Volcano as the major destination, and should book either one of the Big Island tours above, or the Oahu to Hilo Fly-Drive. Occasionally though we get requests for an Oahu to Kona Fly-Drive so we are including that option here. Once you get there, you are free to drive around and explore the island on your own. This package does not include transportation between Waikiki and the airport. The driver of the rental car must be 25 years of age or older with a major credit card in his/her name. Time: Typical itinerary is around 7:00am flight and 9:30pm return on the same day. If you have other flight requests, please contact us at 1.877.678.7333.